Happy 4th of July. God Bless the USA! Also wishing all my Canada blogging friends a Happy Canada Day! Sorry, this is a day late. I am sharing some of the local woodpeckers seen in my yard and the adjacent woods. Sorry, from a rainy windy day there are pieces of suet on my window. Please excuse the dirty window. This suet feeder is just outside my dining room window. 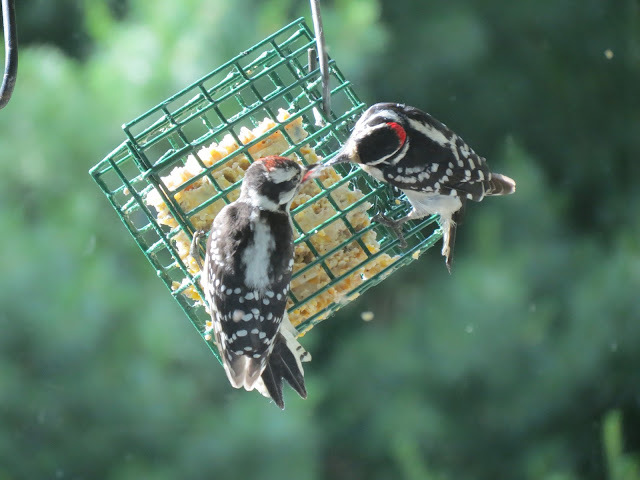 On this day I watched an adult male Downy Woodpecker feeding his young male. My youtube video showing a couple of Downy woodpeckers seen off the fire road. Awww, what a sweet scene! Have a lovely day! So wonderful to watch the birds feeding from your dining room window and capture them in action without disturbing them. Thank you, Eileen for hosting and Have a great weekend! Thank you for hosting Eileen. it's good to be back and starting to get settled in for the summer/fall season. As always I loved your walk and your birds. Very nice critters, great shots. I love your woodpeckers. Happy 4th of July, Eileen! 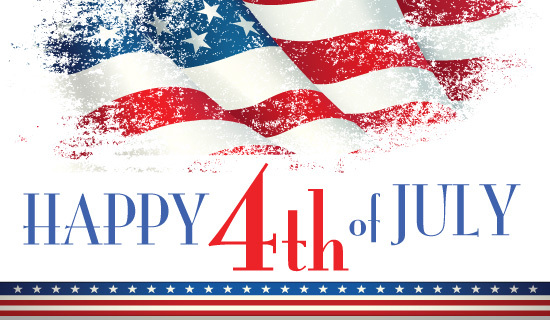 Happy 4th July to you and your family. Love the video of the Woodpeckeks. Many thanks for hosting and I hope you have a very happy wekend Eileen. Good morning, Eileen. I just loved the video--so relaxing listening to the sounds of nature and watching those downies. Hope you have a terrific 4th. Hello Eileen! :) What tender moments, just lovely to see. Beautiful photos. Greetings from India. They have a lot of efforts to do for a snack. They are really enjoying the suet. They are cute too. Have a wonderful 4th Eileen. The birds are so fun this time of year! Sweet images of your yard birds! Have a very nice wekeend. Lindas fotografias e gostei de ver o video. Nice closeups of the woodies, and video shows interesting parental behavior. Hello Eileen, lovely photos of your woodpeckers and delightful video. Trying to slowly catch up but still not getting a lot of computer time. Happy 4th of July weekend :) and thanks for hosting. Have a happy weekend 4th July Eileen. Best wishes to all of my American cousins. Thanks for hosting once again. Love those little downies. All the best. you sure have had a woodpecker week...LOVED the video, what a great scene to capture!!! 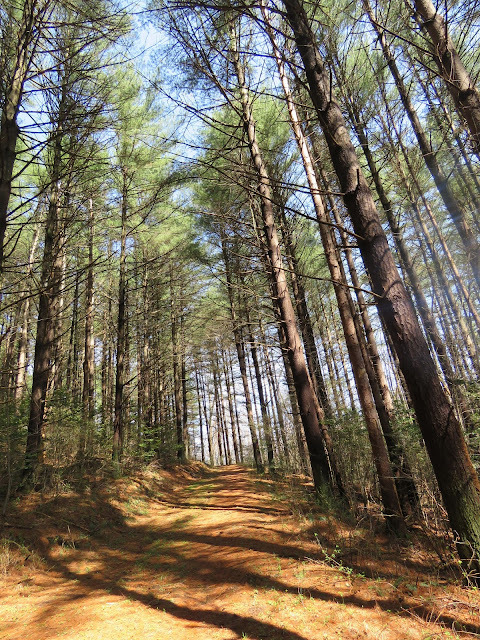 and the forest background sounds were great!!! have a wonderful weekend eileen, and as always, thanks for hosting!!!! Happy Fourth, Eileen, and thanks for hosting one of my favorite memes. I enjoy watching the adult birds feed their babies too. Have a great 4th of July! Good morning Eileen I'm back this week from Alabama so I can join in too! A very Happy Fourth of July to you too. Lovely little critters snacking here today! Enjoy your critter filled day! Gotta love the woodpeckers. Happy Day. I have to find shady spots for the suet this time of year or it gets a bit gooey and drippy. Those two are great. That must be so fun to watch them like that. Aww....your woodpecker photos are cute! Happy 4th! Great post Eileen . . . Loved hearing the bird chirps in the video too. Eileen, may you and your family enjoy a pleasant Fourth of July weekend. Thanks for sharing. I haven't seen woodpeckers feed each other before - very interesting! Love the woodpecker Dad feeding its young ~ wonderful nature photography! Hi Eileen, it's always nice to see your Downies. We got here to Cacapon Mtn. in Berkeley Springs Thursday afternoon, but no birdies have come to get any suet yet. Also, I'm not hearing the nuthatch-chickadee-titmice racket at all. Lovely shots. You make me miss having a house! Thanks for sharing yours! And thanks for the party! I posted my Annual Pet Parade! Blogger and Goolge have stolen my comments option. It's disappeared from my posts. You might can comment by clicking on that little Google+ icon at the bottom but it will take you to my Google page. My email is Slegan@yahoo.com if you want to come over and say "hi". I love these pics of the attentive dad, Eileen! Didn't have a critter for today - hope to be back next week! Have a great weekend and Happy 4th July wishes too! 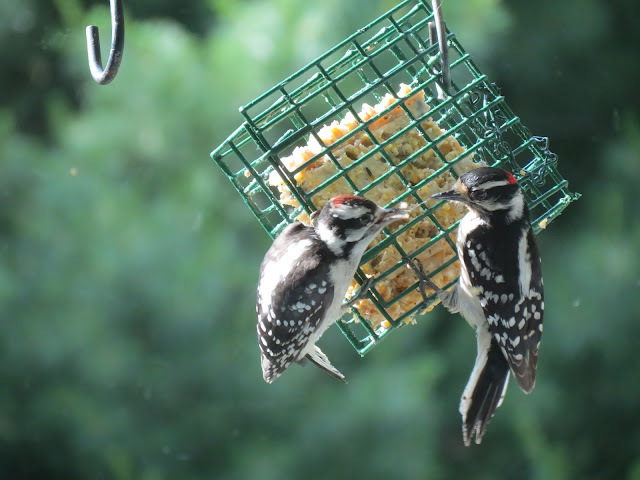 The downy pair are really loving your offerings -- they've found the perfect cafe! Thank you so much for hosting -- I love this sharing party!! Cute dangling woodpeckers. Happy 4th of July! Fantastic the Woodpeckers, I can look again and again. Lovely shots of the woodpeckers. Woodpeckers are smaller than I though I pictured them as being bigger. Love the video and pics of the Downy. I must try a video, good job Eileen. Wonderful shots! I love that the adult is feeding the youngster. Happy 4th of July weekend. Wishing you some fun celebrations. You have to really love to follow behind the window. Video was also nice to look at. Thank you for your challenge! Great parental instincts in the video today. And the pair of woodpeckers in your photos....sweet!!! Thank you so much for adding your post link! We birders at I'd Rather B Birdin' always appreciate you participating!! Love these woodpeckers! So pretty and fun to watch. I'm glad to have found your meme and hope to participate often! Such great photos Eileen, love the pair of them swinging on the suet feeder. great pictures of the birds as usual. loved hearing the bird chirps in the vid too. 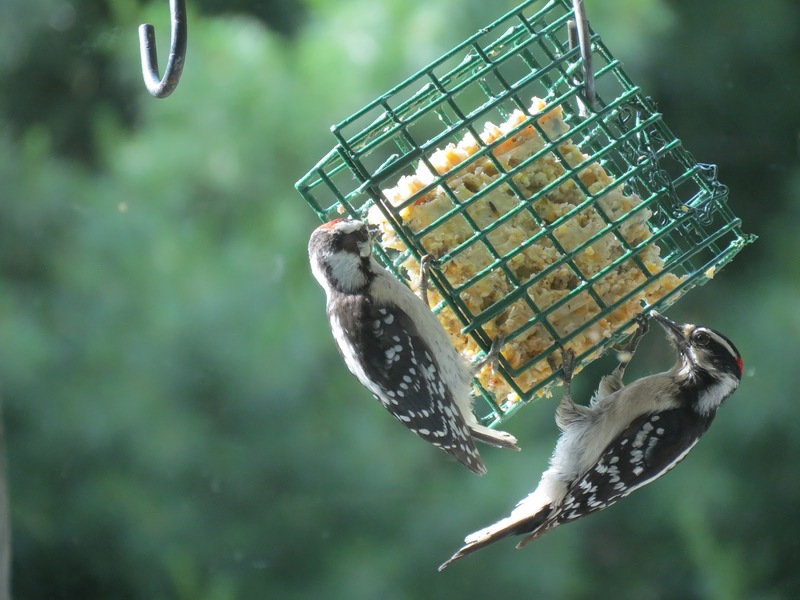 There are always Downies enjoying my suet..Great shots..HAppy 4th..
Great work, Eileen! Lovely post! Little woodpeckers are always fun to watch!!! Great catch!! stunning photos of the woodpecker. So beautiful. Gostei de ver os pássaros, parece que estão comendo.